Maharani is, without question, my favorite Indian restaurant in Charlotte. Maharani is where I had my first date with my partner … on September 21, 2009. 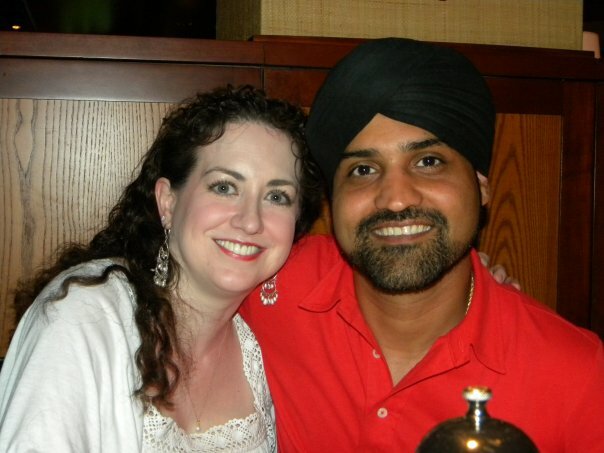 My partner and I on September 26, 2009 – five days after our first date at Maharani. Little did I know I was about to fall madly in love – with Indian food! And, Maharani was my re-introduction to Indian food. Charlotte, until recently, was not very diverse. Growing up, there was only one Indian restaurant in Charlotte, NC and one Indian child in my grade at school! (Maharani didn’t open until June 2002 – two years after I went veg.) I think I am not different from many Charlotteans when I say the general (faulty) impression I had of Indian food was chicken, chicken, chicken (butter, tandoori, tikka masala) instead of vegetables, lentils, and beans. What I like most about Maharani is its consistency and its authenticity. You won’t find any “Americanized,” blanded down foods here. No curry powder or coconut milk or timid spices. What you will find at Maharani is hearty, robust North Indian food, full of spice, flavor, and yes, a little heat. And while it may not be the most elegant Indian food I’ve ever had, or the most creative, it’s always very, very consistent. Unlike some Indian restaurants, where the food is droolworthy one visit and bland, inedible, and greasy the next (hello, Saffron! ), Maharani is always consistently solid. Sometimes my partner and I eat there frequently. Once as much as a year passed between visits. Yet each visit, the food is always comforting, filling, and very, very flavorful. Maharani’s slightly formal atmosphere (white tablecloths, cloth napkins, soft traditional Indian music, waiters always standing nearby to top off your water glass) makes it a perfect for a date night or a business lunch. You will see plenty of Indian customers (always a good sign for an Indian restaurant!). And if you come in at lunchtime, you’ll also see construction workers taking advantage of the $9.25 buffet. The beautiful silk saris and dirty jeans and muddy construction boots make an interesting contrast. Maharani is usually packed – this picture was taken after the restaurant had closed from the lunch crowd. In December my partner and I visited again for lunch. We inspected the buffet (always loaded with veg options) and decided to order the $8.95 “vegetarian plate” off the lunch menu instead. This plate was said to consist of rice, roti, and three separate vegetarian entrees. Since we specified to the waiter “no dairy”, we wound up with a serving of chana masala and two servings of vegetable jalfrezi. The chana masala was good; the vegetable jalfrezi turned out to be excellent. Since we were, as usual, running on Indian time, by the time we finished our meal the restaurant was almost empty. We took advantage of the quiet to ask to speak to the chef. Information Nugget #1: The cook, Kehar Singh, is also from Punjab. He and Amrik hit it off famously! They were soon talking nonstop Punjabi to one another for a good fifteen or twenty minutes. 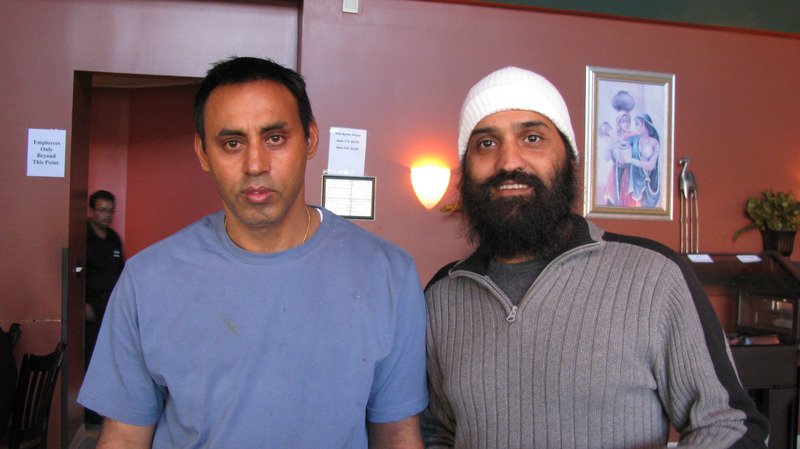 Kehar Singh, Maharani’s chef, with my partner Amrik. 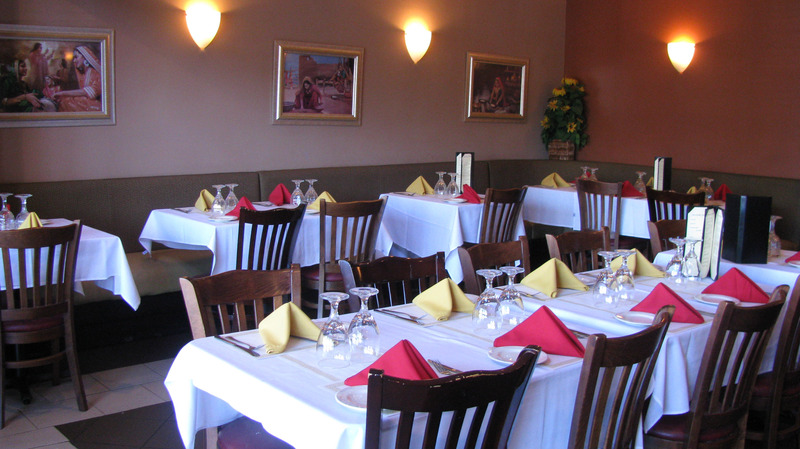 Information Nugget #2: Kehar’s family has owned Maharani since the restaurant opened in 2002. Amandeep Singh is the courtly maitre d’ who greets you at the door; you may also see his regal wife Manjeet gliding about the restaurant like a beautiful queen (a maharani) in traditional sari. Kehar has been the cook since opening … why the food has remained so dang consistent. Truth? There’s only butter in Maharani’s food if the menu specifically states butter. Butter chicken has butter. Hot buttered naans have butter. The rest? Like almost every other Indian restaurant out there … Vegetable oil and margarine. Oh, and I personally find that Maharani strikes a nice balance in the amount of oil used in the food – it’s more than I would use when I cook at home, but significantly less than many other local Indian restaurants. Rice and Breads: Rice is always vegan here. They can also make vegan rotis for you as an alternative to naan. The naan has dairy and is brushed with butter; however, if you call a day or so in advance and make a reservation, they can make dairy-free naan for you. Soups: Dal Shorba, a lentil soup flavored with cloves and garlic, is vegan. Indo-Chinese Specialties: Gobhi Manchurian (a sweet and sour cauliflower dish) and Gobhi Chilli or Mushroom Chilli are vegan. Biryani Rice Specialties: Vegetable Biryani is vegan. Vegetarian Specialties: The key here is to look for the words cream or paneer – and then avoid those dishes. (For vegan newbies, paneer is an Indian cheese that doesn’t melt … often those unfamiliar with Indian food mistake it for tofu, but it is definitely dairy.) So your vegan choices here include dal makhani (Amrik was overjoyed to find out these tiny black lentils are not cooked in cream); allo pallak (spinach and potatoes); baigan bartha (smoked eggplant with spices); bhindi masala (an okra dish – definitely try this if you are an okra fan – it’s an Indian “take” on Southern gumbo); channa masala – the classic chickpea dish; navratan korma (the creamy sauce is actually nut-based, not cream-based); allo ghobi (cauliflower and potatoes); gobi kachumber masala (another cauliflower dish); jeera allo (cumin and potatoes); and vegetable jalfrezi (the best I’ve had, anywhere). Salads: The Garden Salad is vegan – but why waste your money on a garden salad at an Indian restaurant? Live a little and order some pakoras or samosas for an appetizer instead! Condiments: Try some mango chutney or mixed pickles to bring your food to a whole new level. Location & Times: 901 South Kings Drive, Charlotte, NC. 704-370-2455. Open 7 days a week. 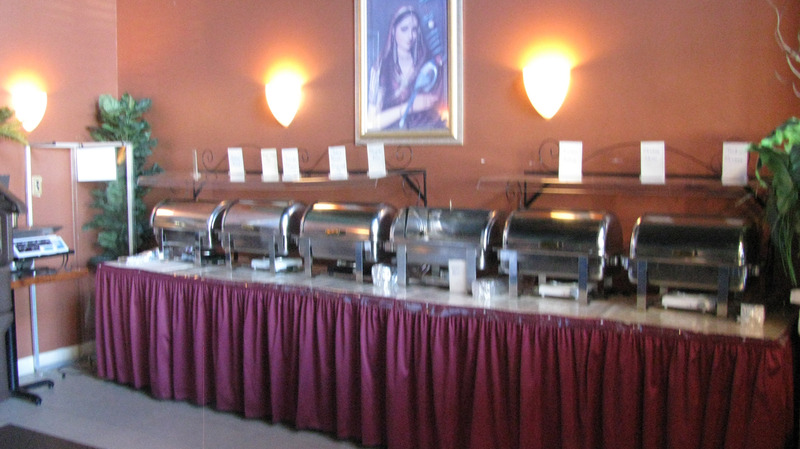 Lunch buffet everyday: Monday – Friday 11:30 AM – 2:30 PM. Saturday & Sunday – 12:00 PM – 3:00 PM. Dinner: Sunday – Thursday 5:00 PM – 10:00 PM; Friday & Saturday 5:00 PM – 11:00 PM. Wow, sounds like my experiences at Saffron. 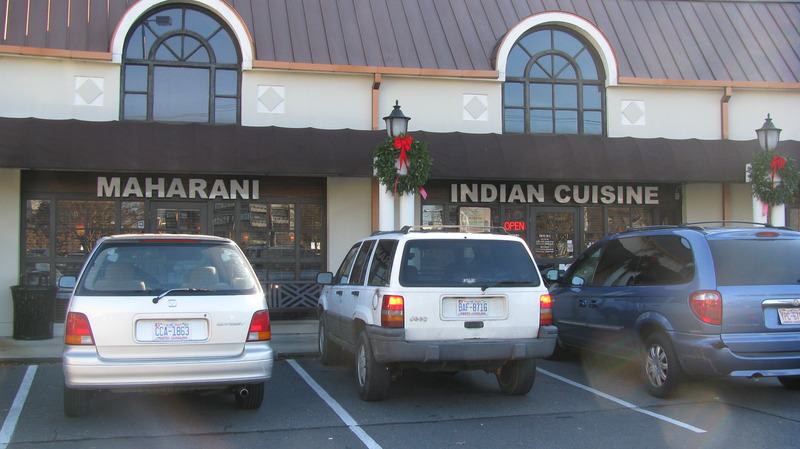 I think Maharani strikes a nice balance – it’s more oil than I would use when I cook at home, but significantly less than many other Charlotte Indian restaurants. Yes definatelly a bit more oil than expected in the dishes. It is more like Pakistani style of cooking, not Indian cusine style of cooking, although some states in Indian especially in the north cook with extra oil. I like their food anyway. I looove how they are willing to work with you on modifying items to be vegan. Two other Indian restaurants that are more than happy to modify things for vegans are Copper and Blue Taj …. both owned by the amazing Pannu Singh.